Antique sapphire and diamond bracelet. Product code: ES5541 Categories: Sold Items, Sold Jewellery. This magnificent antique bracelet is sure to get attention every single time that it is worn. 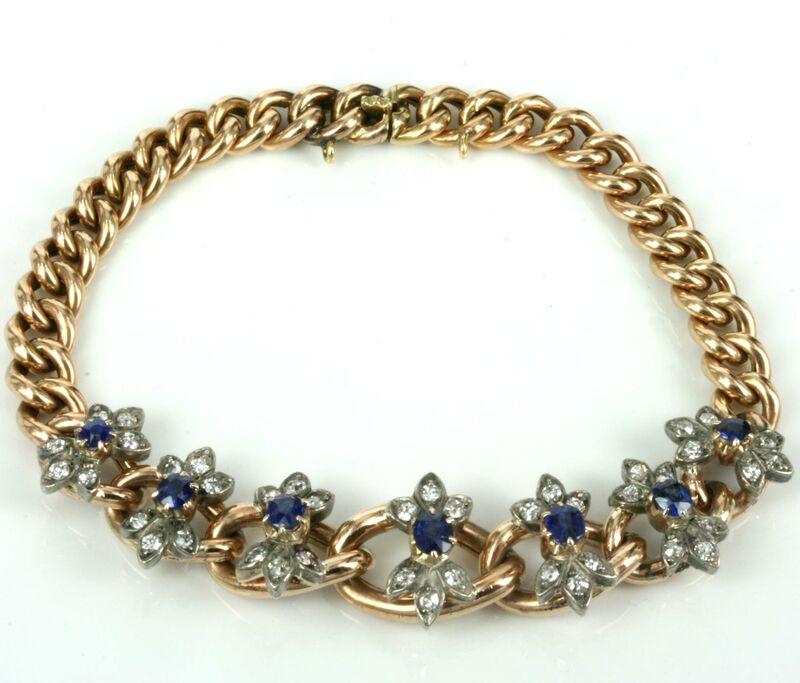 Made in early Edwardian era of the 1900’s, the bracelet is made in 15ct rose gold and is set with 7 series of sapphire and diamond set pieces that really sets this bracelet off during the night. In total there are 7 lovely sapphires that totals 1.20 carats and all are matched so well in colour. Each setting has 6 diamonds and in total the 42 diamonds totals 0.42 carats and sparkles on the wrist so well day or night. The bracelet is made up of traditional curb links that measure 5.75mm wide and the ones set with the sapphire and diamonds range from 11.4mm wide to 13.7mm wide for the one in the centre. From end to end the bracelet measures a comfortable 17cm in length and is wraps around the wrist so elegantly as a fine antique bracelet should. This really does look so sensational on the wrist and it will make any woman proud to wear it.